MADISON, Wis. - In Wisconsin, the concept of "informed consent" means a doctor must give the patient the tools necessary to make an informed decision about their care. However, the state Legislature is considering changing that law, to let doctors decide which treatments or diagnoses patients should know about. 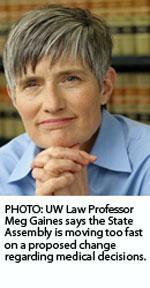 A doctor's failure to obtain informed consent is a form of malpractice, said Meg Gaines, a University of Wisconsin law professor, adding that such cases are very rare. "Frankly, it doesn't happen that often in Wisconsin, and I think that's fine," she said. "That's not the point. The point is that we need to move forward on engaging patients in determinations about what should happen next." Current law is based on having reasonably informed patients make the ultimate decision about what they want their doctor to do. Gaines described a "reasonably informed patient" as "neither someone who says, 'I don't want to know anything, doc, just do what you gotta do' - which is sort of, probably unreasonably, not wanting to know - nor a patient who says, 'I need to know everything down to the microscopic level. I want to see all the tapes, all the results, I want to talk to all the physicians you had reading my diagnostic tests, I want, I want, I want ...' "
There were 117 cases filed alleging malpractice in Wisconsin in 2012. Gaines said that isn't many. "If you are an insurance carrier for malpractice in the average state, you pay out 83 cents on every dollar you take in in premiums," Gaines said. "In Wisconsin, you pay out 45 cents." Before taking away a patient's right to self-determination, Gaines said lawmakers should be taking more time to carefully consider such a fundamental revision. "We seem to have driven right past that exit - or, at least, we seem to be driving right past that exit in this bill," she said, "and I hope that we will pull off at roadside assistance and get ourselves a Blue Ribbon Commission." Supporters of the proposed change in the law said it addresses a malpractice problem, but Gaines said it's a problem that doesn't exist in Wisconsin. The State Assembly will discuss the bill Thursday. The measures are AB-139 and SB-137.